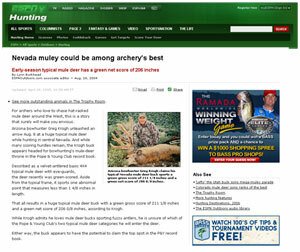 Described as a velvet-antlered basic 4X4 typical mule deer with eye-guards,the deer recently was green-scored. Aside from the typical frame, it sports one abnormal point that measures less than 1 4/8 inches in length. 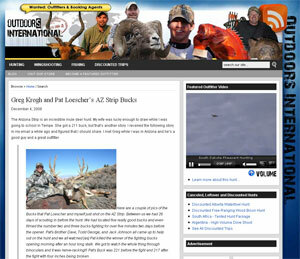 The Arizona Strip is an incredible mule deer hunt. My wife was lucky enough to draw while I was going to school in Tempe. She got a 211 buck, but that�s another story. I received the following story in my email a while ago and figured that I should share. 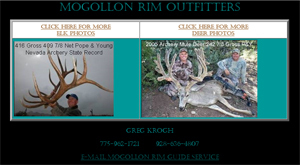 I met Greg while I was in Arizona and he�s a good guy and a great outfitter. 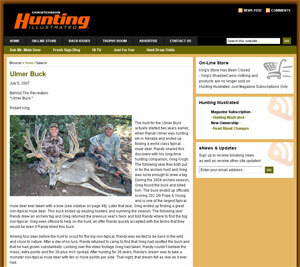 The hunt for the Ulmer Buck actually started two years earlier, when Randy Ulmer was hunting elk in Nevada and ended up finding a world class typical mule deer. Randy shared this discovery with his long-time hunting companion, Greg Krogh. The following year they both put in for the archery hunt and Greg was lucky enough to draw a tag. During the 2004 archery season, Greg found the buck and killed him. The buck ended up officially scoring 202 2/8 Pope & Young and is one of the largest typical mule deer ever taken with a bow (see sidebar on page 49). Later that year, Greg ended up finding a great non-typical mule deer. This buck ended up eluding hunters and surviving the season. TIME. THAT IS THE essence of a successful Nevada bowhunt: time not measured in minutes, hours, or days, but time measured in weeks. 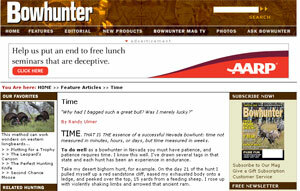 To do well as a bowhunter in Nevada you must have patience, and patience requires time. I know this well. I've drawn several tags in that state and each hunt has been an experience in endurance.